Recently one of my staff team handed in her notice, I was very sad to see her go because she is a great practitioner and a lovely human being, but I was happy to see her progress in her career. Naturally I wanted to give Miriam a leaving gift that was personal from me to her, no shop bought gift , it had to be hand made. A cushion was all I had time to achieve, so this is the tale of Miriam’s cushion. I decided all would be made from my fabric stash, and wanted something very pretty, so Liberty prints seemed to fit the bill. I wondered if perhaps there was a block called Miriam, well there is but it isn’t particularly pretty, and its also known as Crazy Susan, so that wouldn’t go down well. Stars was my second thought. Pinterest supplied this idea, Miriam’s cushion was going to be Fab. 15 different fabrics were picked out of my stash, and a new white on white fabric was bought to tie them all together, there was nothing suitable in my stash. 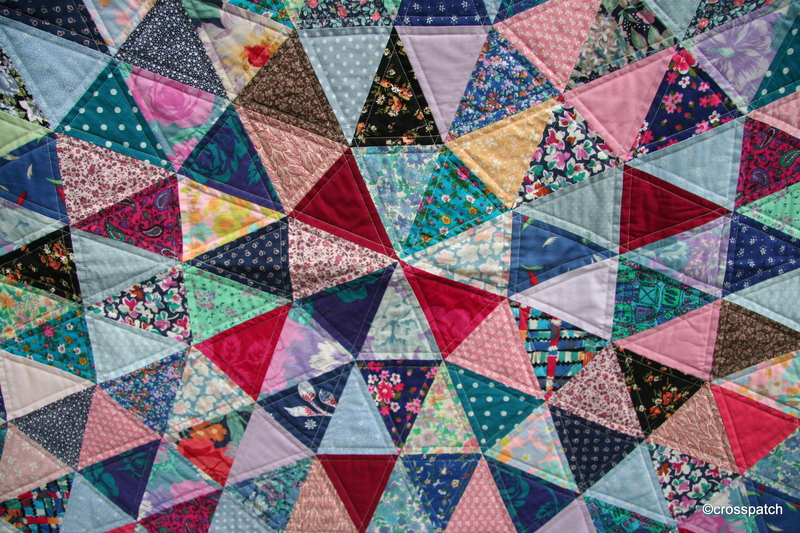 From each fabric one 2 ½ “ square and four 2⅞ “ triangles were required. 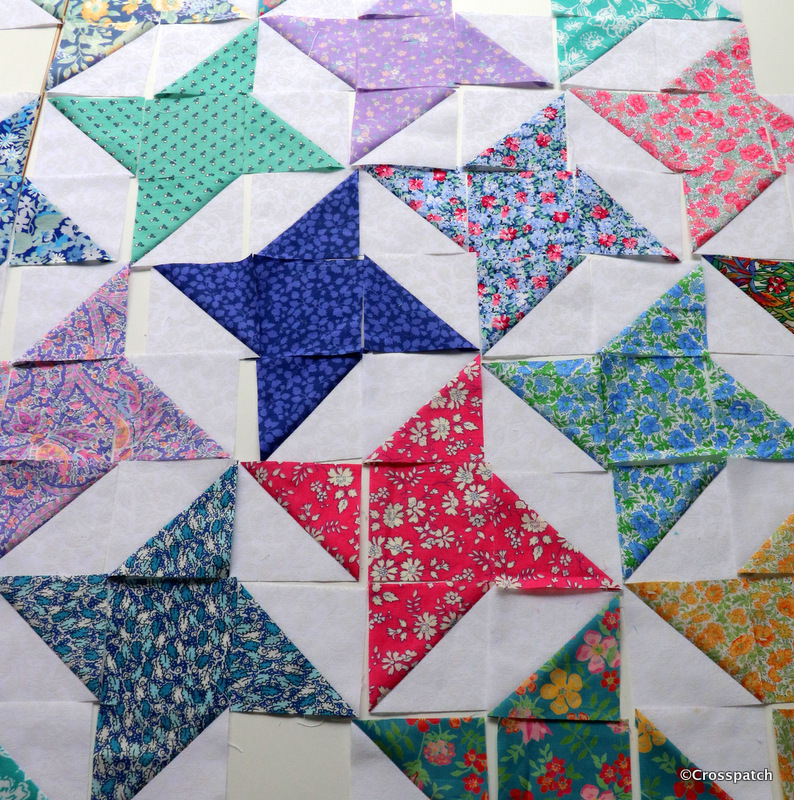 I found it easier to cut 2 x 3 “ squares from each fabric and the same from the white to make 4 half square triangle units by putting a Liberty fabric square right sides to right sides with a white square, sewing two lines half an inch apart across the diagonal and cutting them apart, pressing to the dark side, then cutting down to 2 ½ “. 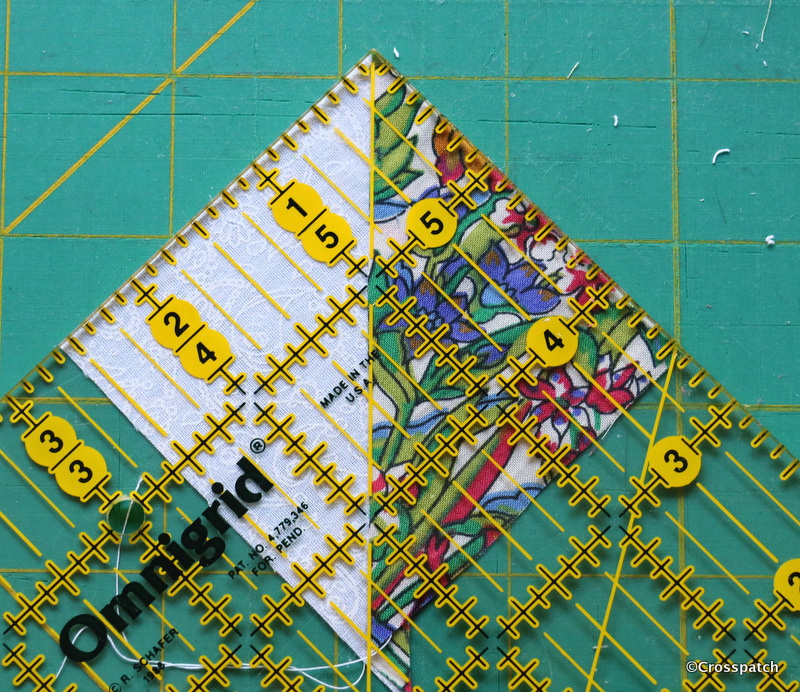 Half square triangle units are traditionally made by marking a fine pencil line diagonally across the paler fabric, so that it can easily be seen, and sewing a ¼“ from either side of the line. We press the seam allowance towards the darker fabric so as not to allow the darker fabric to show through the paler, it also helps to nest seams for a flatter, neater end result. Once I had 15 sets of square and triangles, I had to decide on placement of the fabrics, with this pattern there are no blocks which can be made up and colour placement decided later, each fabric interlocks with its neighbours row on row , so the whole design must be laid out in advance. Thank goodness it was only a cushion, I don’t have space to lay out an entire quilt in this way. Numbering the rows so that I didn’t get myself in a tangle I stitched each row individually, then pressed the odd rows in one direction and the even rows in the other direction so that the seams would nest neatly. I was under time pressure, so as I worked I considered how to finish Miriam’s cushion, I wanted to finish the edge with a binding which would look like piping without the faff of having to use piping. But that left me with a problem of how to close the cushion cover. A Zipper looks better than an envelope back, which I always think looks baggy and unfinished, but I couldn’t figure out how to put a zipper in a bound edge. So rather than make a matching back I had to make a smaller version of the front for back with a sashing to insert a zipper and leave a raw edge to bind. 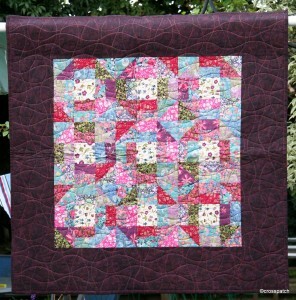 Each side was sandwiched with a 2oz wadding bought specially at Abakhan (https://www.abakhan.co.uk/stores) in Preston; and quilted simply with diagonal lines, happily because the wadding was quite chunky, it didn’t need a lot of close quilting. I sewed the front to the back wrong sides together with the raw edges on the outside, a ¼ “ seam allowance. Finally I cut and stitched the binding ; I cut a 2 ¼ “ binding and folded it in half lengthways, right sides out, sewing it to the front of the cushion just a smidge wider than ¼ “ so that the first seam isn’t showing. It also stabilises and strengthens the seam around the edge being stitched round a second time. Then rolling the binding over the raw edge by hand, because I have folded the binding I now have a folded edge to hand stitch along the seam line on the reverse side. I used the same fabric for the binding as the sashing so that any wobbliness of the binding or the hand stitching would be less obvious on that side. I was burning the midnight oil by this time; Miriam’s cushion had to be finished, she was leaving the following day. I wanted to label the cushion, but not for it to be seen announcing myself constantly, so I made a label and stitched it inside the cushion, just under the zipper. It simply says it was made for Miriam, it is Miriam’s cushion. 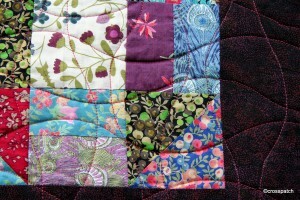 When I gave Miriam’s Cushion to her, I pointed out my two errors, the zipper isn’t centrally placed, can’t figure out how that happened, but I didn’t have time to fix it, and the far corner fabric isn’t quite “right”, but I left it in because, as all quilters know, “only God is Perfect”. There was one final flourish that I had planned to add but I ran out of time. It was a bible quotation I sought out especially For Miriam, a committed Christian, as she was leaving us for another job nearer to her home. I had planned it to be sewn inside like the label. It’s more than simply Miriam’s cushion it is a gift to express fond appreciation of the person she is. Thank you Miriam for passing through my life however briefly, it has been a pleasure to know you, to work with you, to see you develop and flourish in your profession. Pictured is a little piece of work of my mother’s which she gave me, a rose for St Valentine’s Day, this is a sweet little hanging which is paper pieced using four different patterned fabrics to create the rose flower plus a single green for the leaves. The flower centre is from the fabric used for the binding, mum has used yellow French knots of embroidery silks to create the sense of pollen covered anthers in the rose centre. This was a challenge, I think the theme was celebration, and this is a perfect little gift for Valentine’s Day, a keepsake, a rose that won’t wither. Thanks Mum, I love you too. What do you do if you don’t like the challenge block? Hide it. 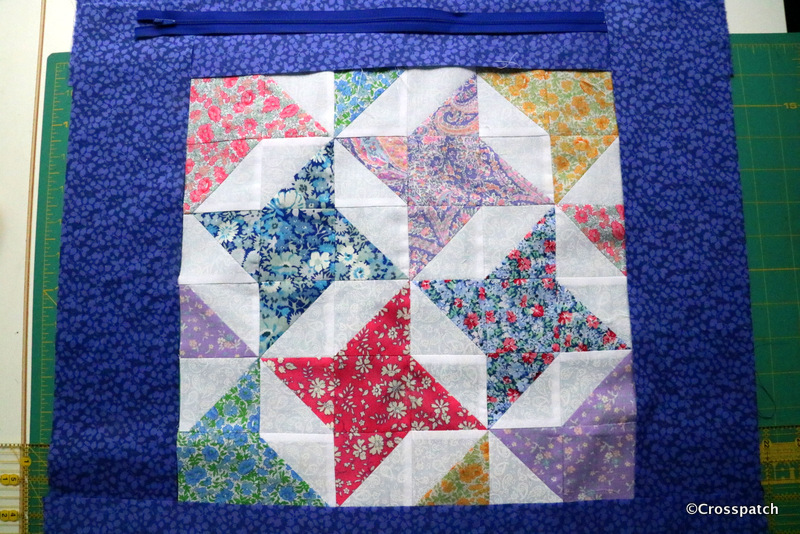 This Lap quilt is made using the Churn Dash block (or monkey wrench), I think it was the favourite block of our most venerated late member and the instigator of our quilt group’s challenge, Cecily. But I dislike it. 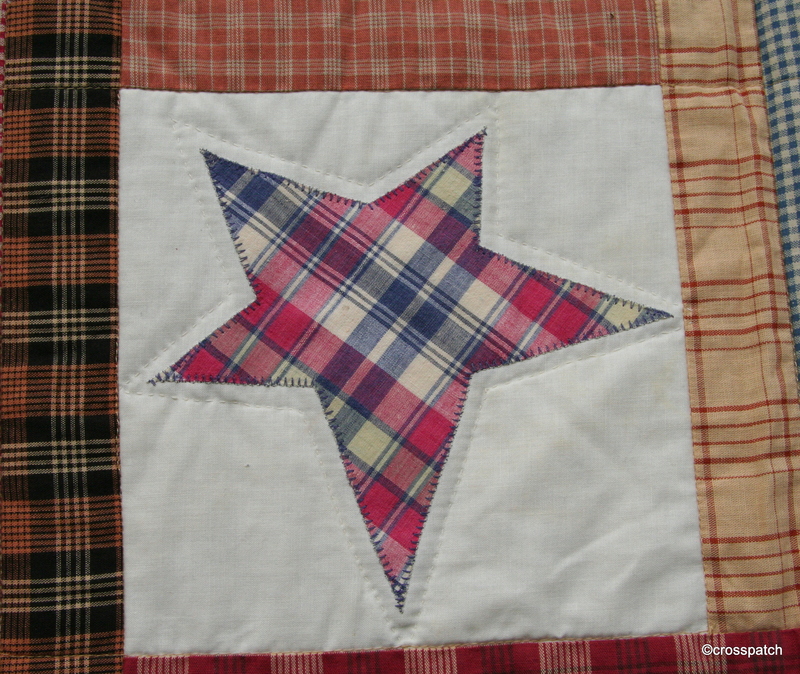 I wanted to rise to the challenge as always but I find the block rather pedestrian, perhaps because I’ve only made it in co-ordinated colours and plain fabrics, so a decided to do it in heavily patterned fabrics and mix it up so that the pattern was lost and the fabric became the star of the piece rather than the block. 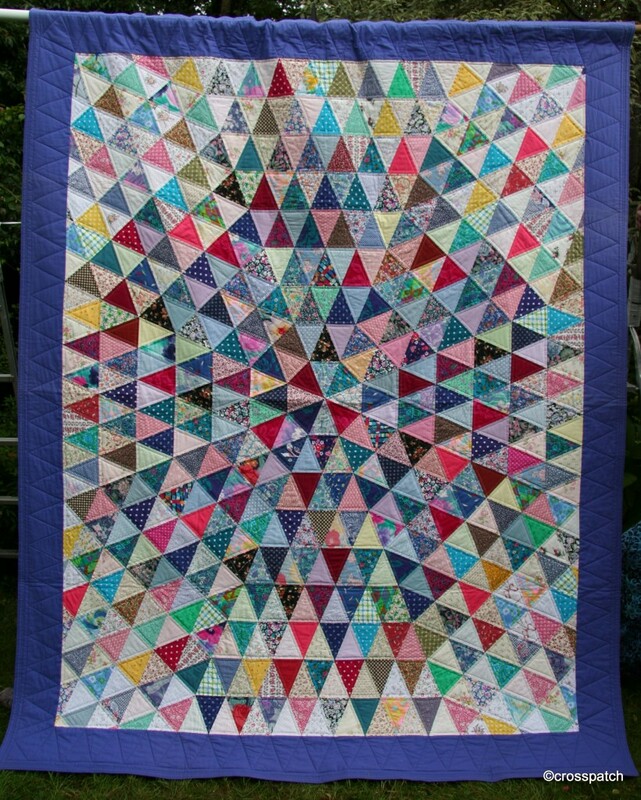 Good idea, but I think I took it too far, the pattern is completely lost and with it the sense of rhythm to the quilt top, as a consequence what stands out are the pale squares, rather than the fabric in general. 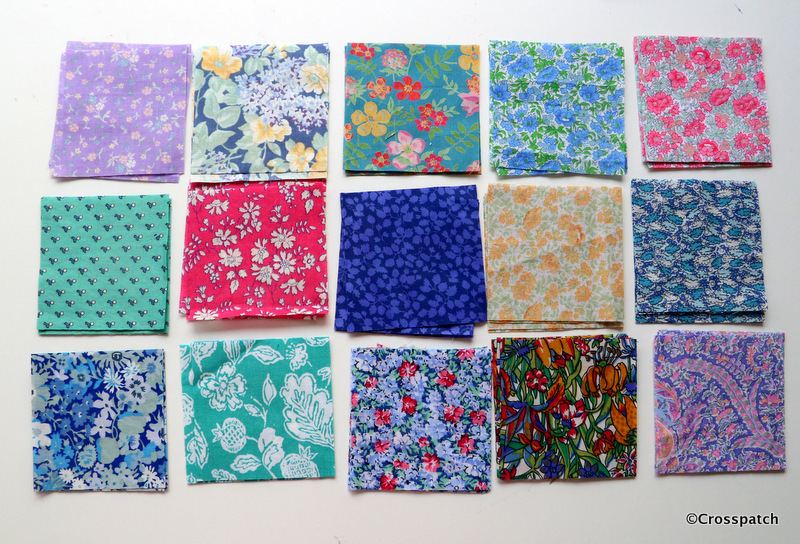 All of the fabrics are Liberty scraps from the printer’s factory shop, I’m so lucky to live nearby; I call in occasionally to buy craft packs, but I can also buy off the roll if I have a big project in mind. In other senses I’m happy with the quilt; it hangs beautifully flat and straight and is evenly quilted throughout. 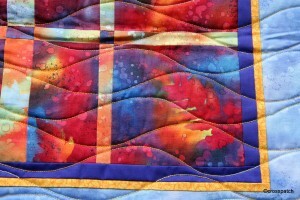 I created my own wavy line quilt guide using taped together strips of cereal packet, with a hand drawn wavy line. On one side the wavy edge has wide and fairly flat curves, on the other side they are closer together and therefore appear deeper. 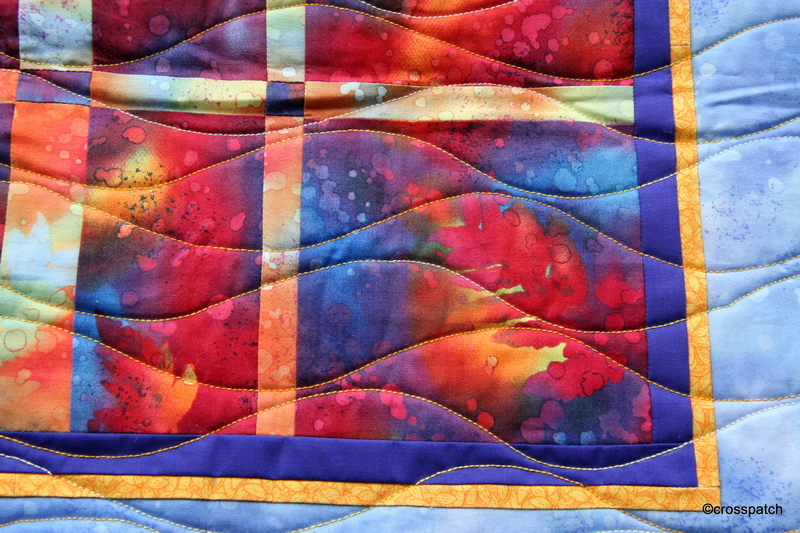 I used the flatter side, drew on the lines with an air dispersible pen, and chalk pencil taking the quilt pattern right out in a continuous line to the edge of the quilt. 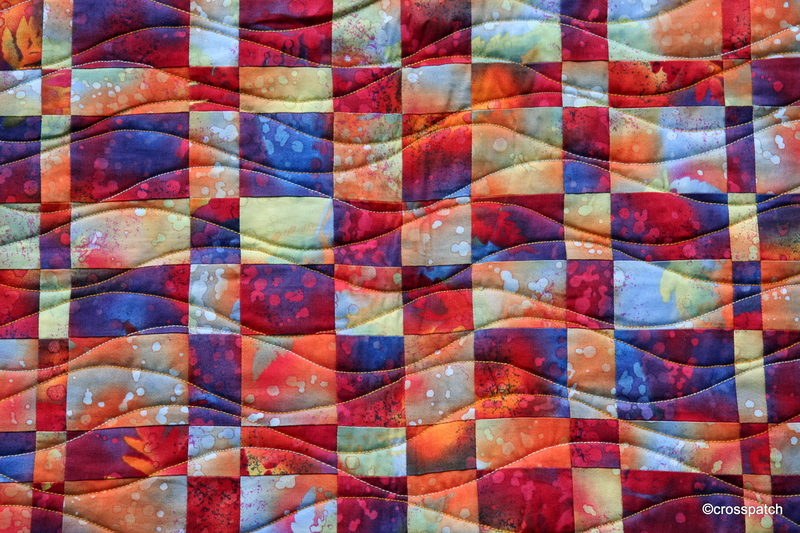 I like the curvy line quilting because it’s easy to do and does not rely on the accuracy of the piecing, in fact if your piecing is not accurate curvy line quilting is very forgiving. That’s always a good thing. My quilt group have an exhibition biennially; we use it as an opportunity to raise money for charity and like to choose a small local charity rather than a large national charity. We don’t raise much but a little often goes a long way for a small charity, and makes a real and tangible difference. 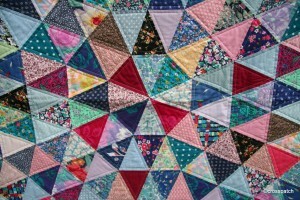 We always create a group quilt to raffle and to publicise the forthcoming exhibition. 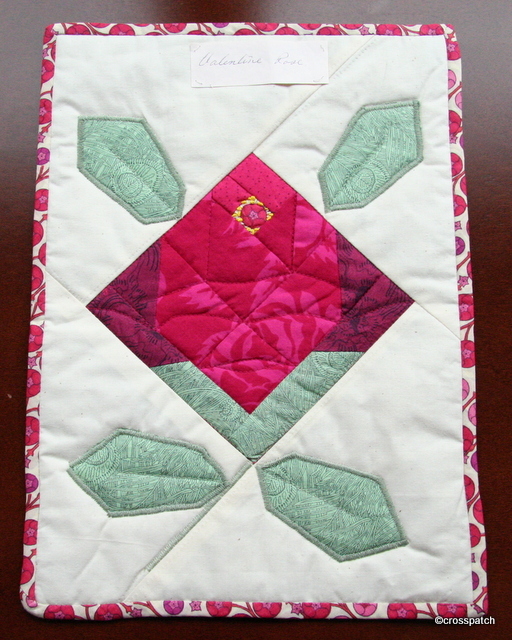 This design was presented as a possible group project to create a quilt to raffle, as a member of the committee at the time I took the pattern and volunteered to give it a trial run, to see if it would work as a group quilt. There is one simple piece to cut, and to achieve an optical illusion similar to the tumbling blocks design, it’s necessary to chose fabrics in light, dark and medium tones, one of each tone is then sewn together to produce a triangle; placing the light, dark and medium in the same position in each block to give the effect of a pyramid viewed from above.It’s important always to have the three tones in the same position because the 3D effect of the pyramids only works if the light appears to be coming from the same angle across the whole surface of the quilt. 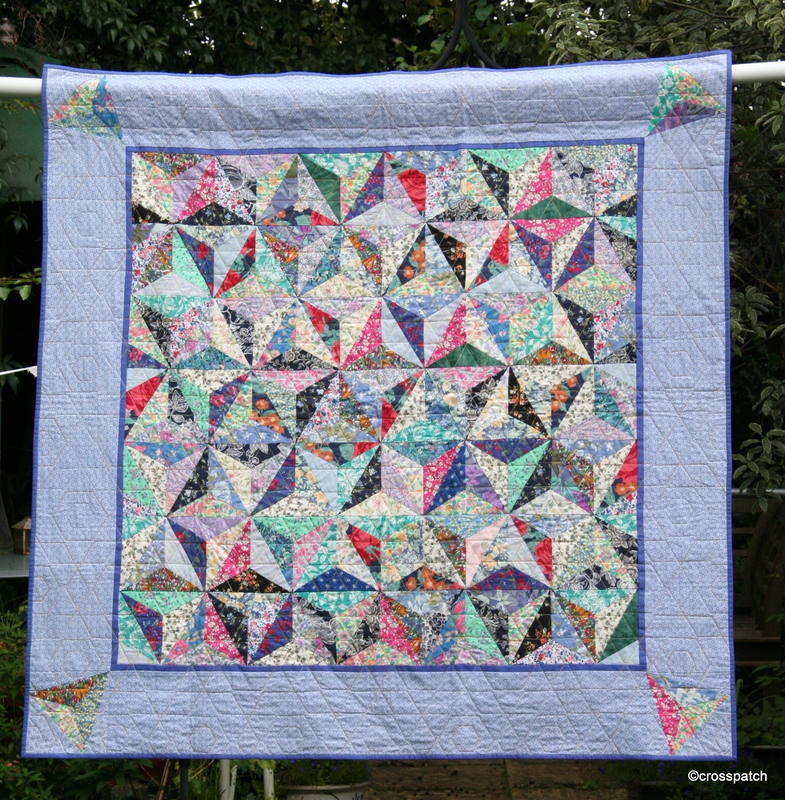 Although the triangles are put together in rows one pattern which also emerges is the hexagon; it was the hexagon I used as inspiration for my quilting design, as can be seen where it extends into the border.The design never made it as a group quilt, there were just too many possible variables, group quilts work best when the variables are kept to a minimum, this pattern required hand drawing of pieces round templates, cutting with scissors not rotary cutting, there would be fabric placement variables, seam allowance variables….. etc… etc. No there were just too many possible ways in which blocks made by many individuals would fail to go together neatly to produce a quality finished article. Nevertheless I liked the finished article, so much so I began to make another quilt, from the same design but with a limited palette of just three fabrics, but somehow, somewhere I lost the template, and the impetus to finish, so for years I had a number of cut pieces and a bag of bits, but no template. 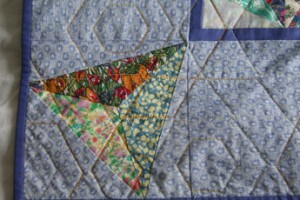 The original pattern came from an Australian Quilt magazine, which didn’t belong to me, and I’m not sure who owns it. 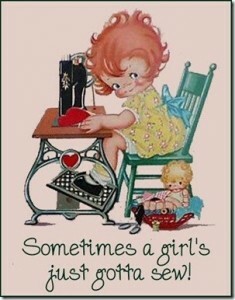 I have subsequently found another template for the same design in a quilting book I bought in (of all places) ALDI. 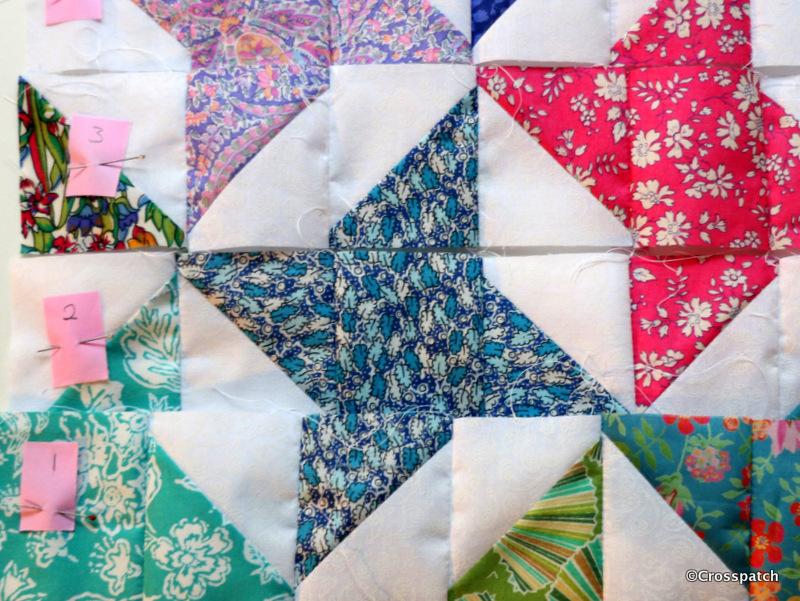 Maybe I’ll get round to finishing that quilt, or maybe not, the thing is … the moment has passed. Have you ever been stalked by a thought, or an image, or a half formed plan? Some months ago I saw a block of a yacht and had a half-cocked idea for a quilt but the block itself didn’t really do it for me, it had no sense of movement and wasn’t very yacht-like, so the idea didn’t progress further than that initial “hmmmm” moment. 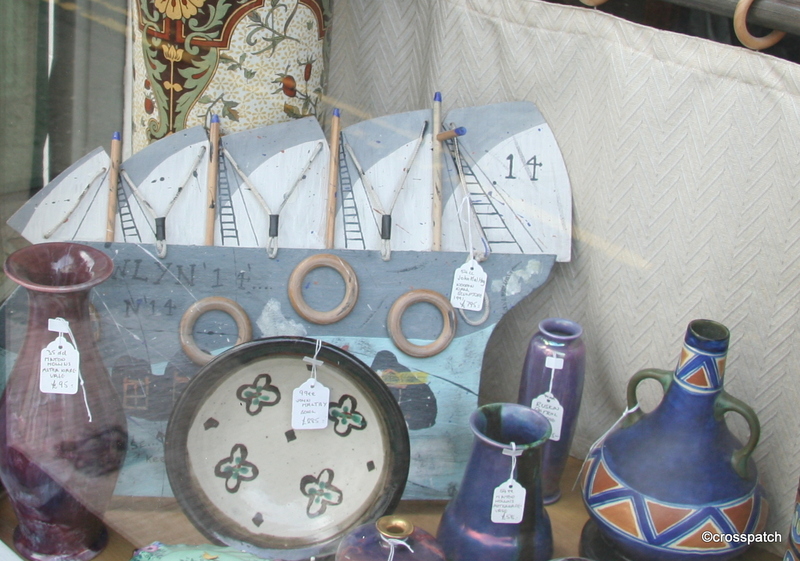 However since then I have been stalked by images of yacht’s, not just the real thing at sea or on lakes but wherever I go, in stained glass, in shop windows, in magazines or on fabric, toy pond yachts on window sills in houses I pass (not one but several in a single week), postcards, even in a bag of Haribo sweets, and a shower curtain. 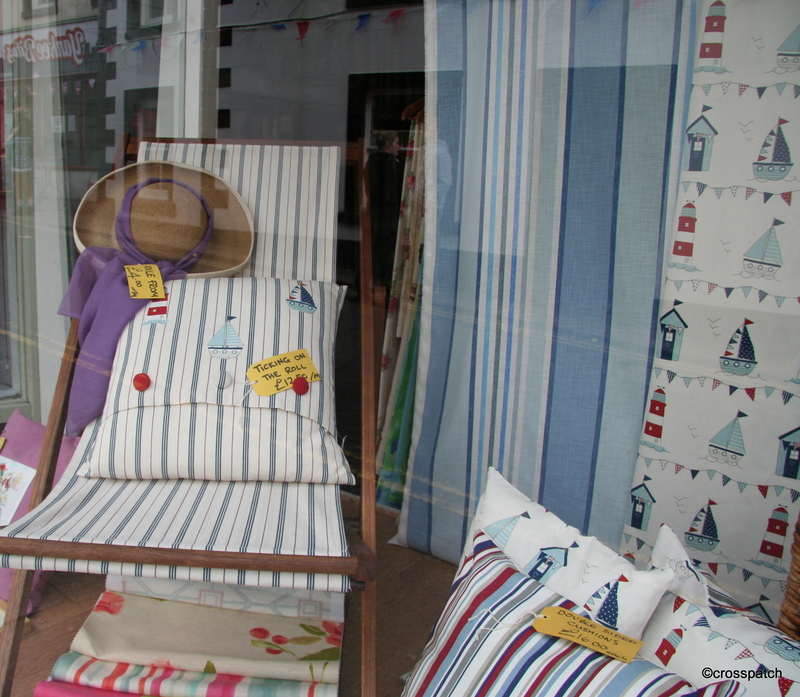 Am I being stalked or are Yacht’s simply ‘on trend’ at the moment, either way I think I need to work out my thoughts in fabric. What is a Yacht without billowing sails, a floating gin palace; a glorified floating caravan? My Yachts must have wind in their sails, and movement in the block, I don’t want the quilt to represent a flat calm, but I’d rather have a brisk breezy day than stormy weather. Young people object to labels, as applied to themselves, they will tell you they are independent free thinkers, unique and not following anyone else in their choice of clothes, music etc and yet to the aged observer there are types and styles which are identifiable to those young people more easily than to the uninitiated. They seem within their friendship groups to be wearing uniform. Do you know the difference between a Goth, Emo and a Mosher? No, neither do I, but they all wear gloomy clothes and dye their hair black, choose black over any other colour, and don’t laugh much (well that’s just a personal observation, it’s like a season ticket to depression). My Dear Nephew, that sweet boy with the gappy teeth, is now a grown man, he lives in a bedroom painted black and grasshopper green, and yes it really is bright green. 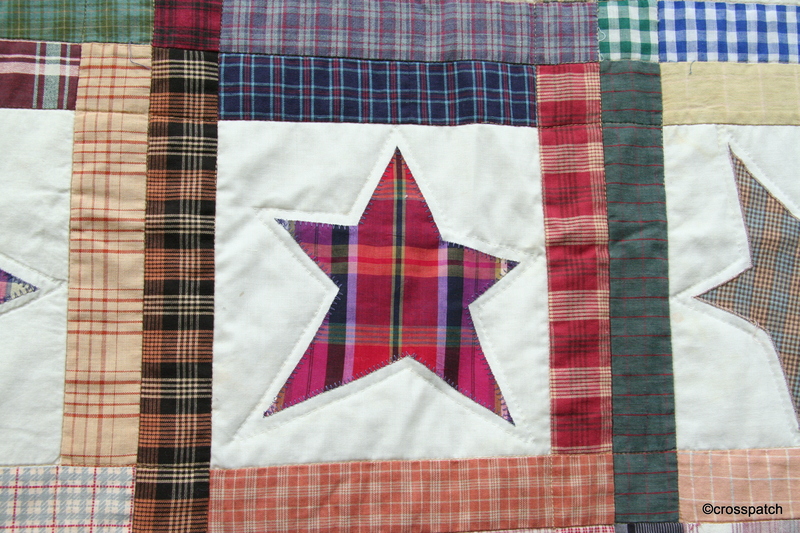 The lovely Appliqué star quilt I made him when he was 6 no longer meets his colour preferences, so my mother made him a new quilt a couple of years ago inspired initially by Amish quilts,but also by the neon bright colours and black that he was wearing then and the chequered patterns which were popular. Out of the fabric that was left when this one was completed my mother managed to make a similar smaller one for my Stepdaughter who was going through her ‘dark’ period too, thankfully she has left her inner Emo behind. As for my Nephew I hope he will shortly leave behind his black period and escape both his bedroom and his computer games, and seek the daylight. Inspired by the wonderful work of Ricky Tims, based on the Mathematical theorem of Fibonacci, I was inspired to have a stab at one of Ricky’s quilts; the first attempt was for a gift, a cot quilt for a friend who was expecting her first child. I was so pleased with it when it was finished it, that I could hardly bear to part with it, but still, it was made for Eric, and so to Eric it was given. Eric now prefers aeroplanes, so it lives in his parent’s room, hanging on the wall. Can’t argue with that! This is my second attempt, in Fossil Fern fabrics. I have to say with this particular design, accuracy is all. 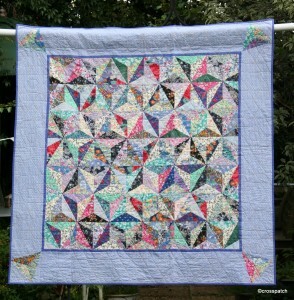 Many people will tell you they are not members of the Quilt Police and it’s OK if your points don’t meet. 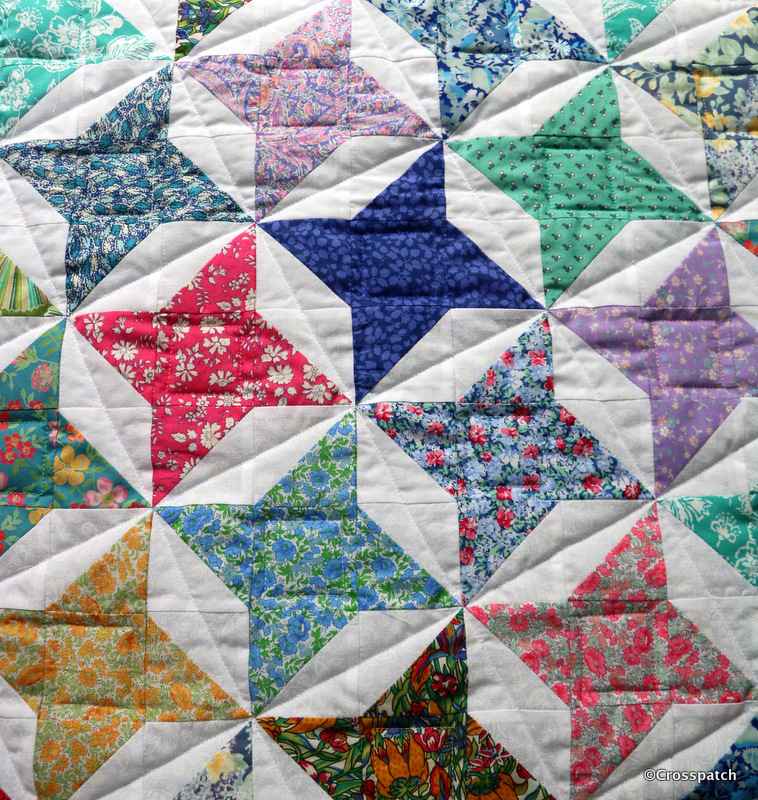 I am a paid up member of the Quilt Police, points have to come to a point, seams need to meet where they are supposed to meet, and I will unpick and try again, once, even twice, but after that I will embrace imperfection and move on; life is too short, and only God is perfect. 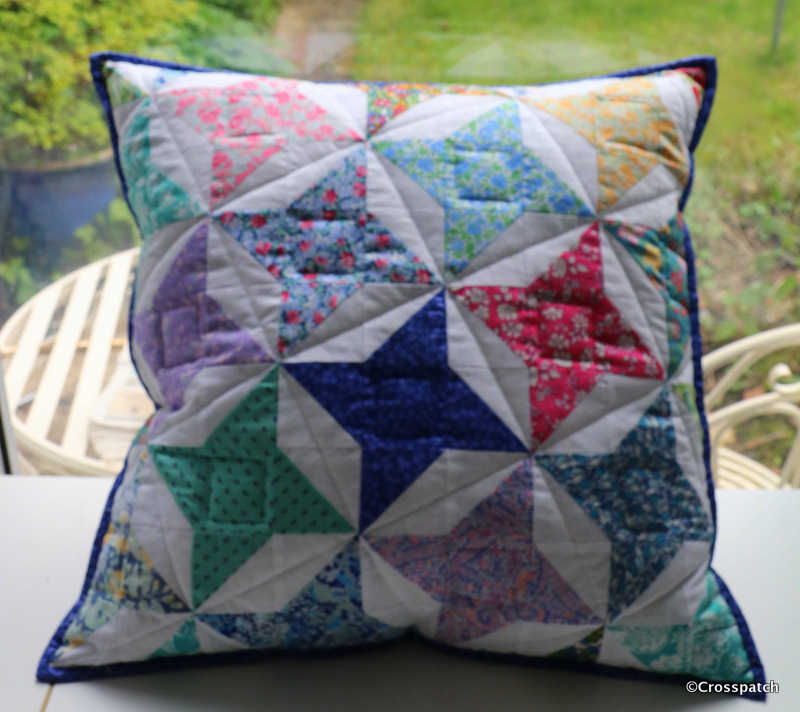 I can be relaxed about points and joins in some Quilt patterns but if you are working to a pattern, inspired by a 13th Century mathematician, then surely to goodness, accuracy is absolutely the point. (Fibonacci’s 1202 book Liber Abaci introduced the Fibonacci sequence to Western European mathematics). Look closely at my joins, I did my absolute best to make sure every point and join met as neatly as I could, mostly that was achieved by careful planning and pressing of seams to make sure every seam butted neatly with the next. It looks very complex to achieve but actually, provided you give it your full and undivided attention, it’s very simple to make, take 4 equal size squares of fabric, stitch two together,then the other two and laying them side by side you simply cut each strip incrementally larger from the centre to the edge and then interleave the narrowest strip from one pair with the widest from the opposite edge of the other pair, and so on till the centre strips are of equal width, stitch together, press, turn by 90 degrees and do it again. I do mean full and undivided attention, don’t have the TV on in the background, don’t be talking to a friend, don’t be singing along to the radio, and for goodness sake don’t be stewing about a row you’ve had, or some other cause for irritation, that way disaster lies. You need to be in a Zen like state of calm concentration when cutting each strip, as any mistake is very difficult to retrieve. 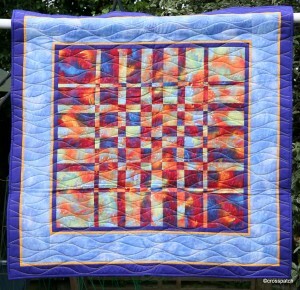 If you want better instructions, it’s a Ricky Tims’ quilt design, I recommend you check out his website (see below) and consider buying one of his books on the subject, where he gives excellent guidance and many more interesting projects. click for Ricky Tims site. My Favourite quilt, the one I’m most proud of, the one which hasn’t yet been washed, and the one no-one is allowed to sit on, is called “There’s plenty more”. 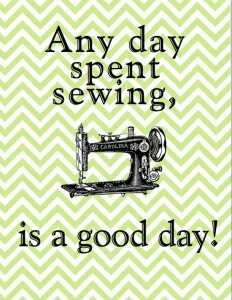 I collected together scraps of almost every fabric in my stash and my mother’s, it even has a contribution from a friend, who began a dress and never finished it, back in the 1980’s. 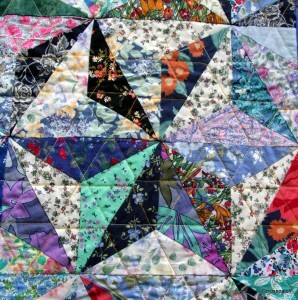 I cut a simple triangle out of them, and then sorted them from lightest to darkest; in order to shade the quilt from dark in the centre to light at the edge, what represented “light” in the centre would be a “dark” at the edge. I made 4 columns of the cut triangles, from darkest in the 1st column to lightest in the 4th, then broadly speaking working from the centre of the Quilt to the edge I began matching the fabric in the first column to the fabric in the 3rd. By the time I reached the edges the fabric in column 3 which had been used as ”light” now represented “dark” . In the quilt is fabric from that favourite dress I wore when I was eight, (see “ There’s nothing new about recycling”), there are also fabrics from the 60’s , 70’s, 80’s, and 90’s, just looking at the centre, I can see the remnants of clothing worn by myself, my sister, my mother and my niece, there are Liberty fabrics, a blouse here, a pair of Capri pants there, Laura Ashley dresses, patchwork packs once sold in the shops, when Laura Ashley was still alive and encouraging hand -made crafts. My Niece’s little baby dresses, shorts I made for her to match my own. 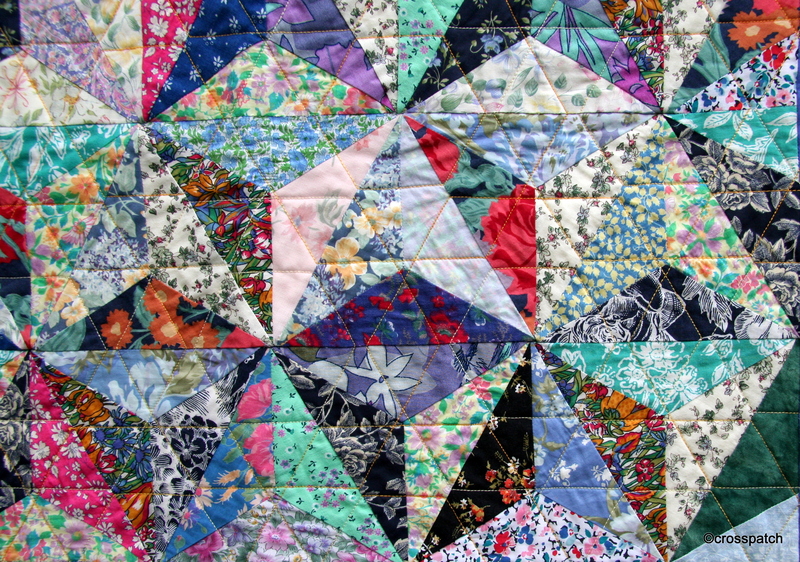 Each time I look at this quilt I see another fabric memory, not just of the individual garments they came from, but where we were and what we were doing when we wore them. Does that mean I need to go scuba diving? Having been woken for a cuddle by the 12 year old, who had subsequently departed to play shoot ‘em up video games on his PC, I was lying awake this morning listening to my Dearest snore when suddenly he spoke. I always know when he is dreaming about work because he speaks in a loud authoritative voice which I think of as his Boardroom Voice, “Cherry, does that mean I need to go scuba diving to collect it?” it’s not often one enjoys a good belly laugh in bed but I roared with laughter, imagining my beloved in a wet suit was enough to make me laugh out loud. I nudged him awake with a sharp elbow to the ribs, saying “you don’t need to go scuba diving Love…… And who’s Cherry?” He rolled over and smiled, I got a cuddle but no answer, “Who’s Cherry?” not that I’m jealous at all, just curious. “Gerry” he replied finally, “I was talking to my Boss Gerry, I was driving up the motorway in the Volvo” (we don’t have a Volvo, sadly) ” when I hit a shopping trolley and crashed the car, a lorry came to collect the wreck, but a man was throwing bits of the Volvo into the River Ribble” explain that if you can! 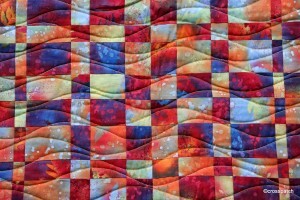 This quilt is a group effort in that it was a “block of the month” challenge of my local quilt group. 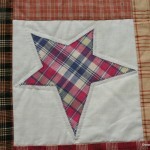 Each month a block pattern is given to group members with palette and fabric type instructions. At the following month’s meeting members contribute one or more blocks each with their name pinned to it. The names are put in a hat and a name drawn out, the winner gets the blocks. 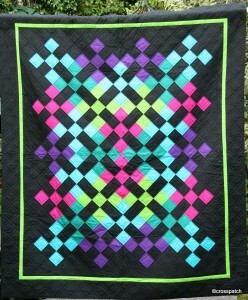 It is a good way of keeping your hand in and trying a block pattern without being obliged to make an entire quilt. If you don’t fancy winning the blocks, don’t put in a block, or don’t put your name on it. If you do want to win contribute more blocks to increase your odds. 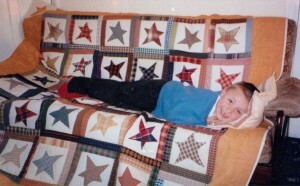 I won this set of blocks 13 years ago, and made it up for my nephew; he was 6 then and as you can see very pleased with his quilt. 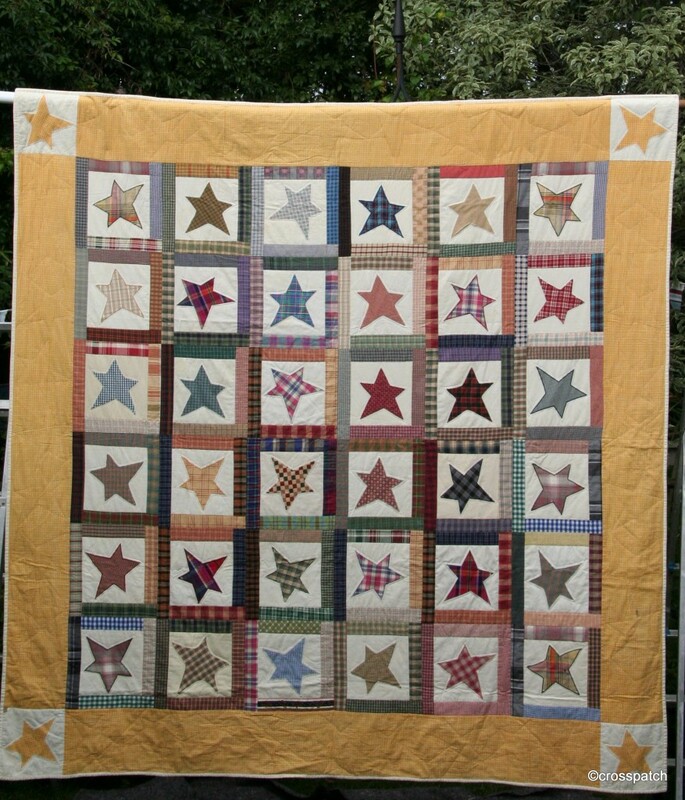 It’s a well loved quilt, by which I mean it is soft and cuddly from washing and use, a little tatty and ragged in places, and I have done a couple of repairs while I had it back from him to photograph . 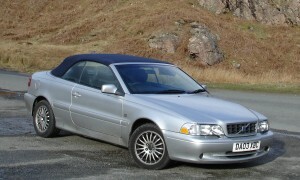 Nevertheless it’s still looking good. 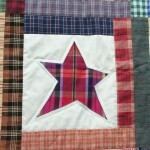 It’s a good choice for a quilt for a man, and could incorporate old shirts to personalise it. I incorporated left over fabric from a favourite seersucker madras skirt I made for myself which I wore till it became too faded and tatty. Had Dad finished with that shirt mum? Another fabric my mother used may be an old shirt of my dad’s. I suspect most fabrics were new scraps leftover from other projects. 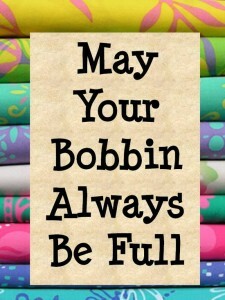 The only fabric I bought was the backing and the border. The border fabric looks good but the weave was rather loose, and may not wear as well as I would like but is wonderfully soft, and the colour works well with the disparate fabrics of the donated blocks. The quilt is now in honourable retirement, my nephew is 18, his current taste requires bright primary colour blocks and lots of black, but that’s another quilt and deserves its own post.